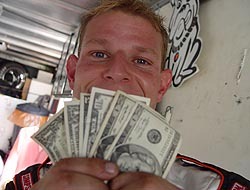 WHAT’S IN YOUR WALLET BURT MYERS? One license isn't enough for Burt. He like to have one old and one new. Myers is a stylish guy, as evident by all of these cards. If it can be done, Burt Myers is certified to do it. So we’ve dusted off out tongs, our white gloves and our disinfectant and decided to go after another Short Tracker’s wallet. 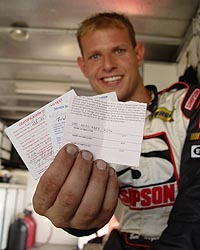 This time around, our victim was NASCAR Whelen Southern Modified Tour driver Burt Myers. And like is normally the case, Myers had no chance to clean his wallet out. 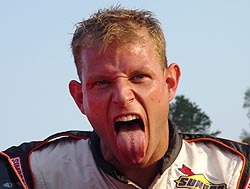 Myers is a long-time Southern Modified competitor. He’s a regular at Bowman Gray Stadium, and some fans’ favorite, and other fans’ least favorite. He and Junior Miller have one of the hottest rivalries in all of the South, thanks to some legendary battles on and off the track. Ok, so we’ve been getting tired of people asking. So we decided, if that is what people want, then that’s what they’ll get. competed in the SMART Tour and are both currently competing with the Whelen Southern Modified Tour. And to no one’s surprise, Myers in right there in the championship points hunt, just a few markers behind rival Miller with just one race to go. So at Motor Mile Speedway, Speed51.com eyed out Burt (or William, or Burton) and took him aside. “Give me your wallet” we shouted. And this is what we found. 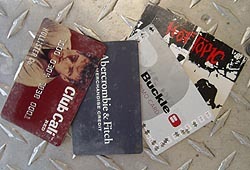 So Burt Myers... What's In Your Wallet? 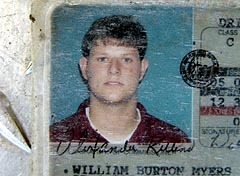 Old Driver’s License – “That is my very first one I think. Gosh, I was about 20 pounds heavier in that photo. That is a funny photo, isn’t it? This one was issued in 1996. 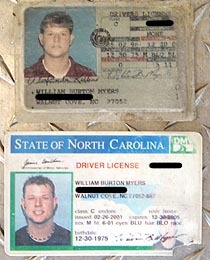 Burt is not a fan of his old driver's license photo. 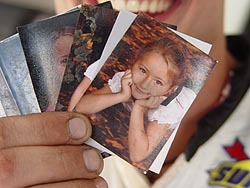 Burt shines when showing pictures of his little girl. Certification Card #3 – “This is where I was helping at DMC, who sponsors me, that is where I was certified to buy cars at the used car sale. "Money, money, money, money...... MONEY."